You are here: Home » In New York, defiant Ahmadinejad says Israel will be “eliminated” | Reuters… Or did he? September 25, 2012 | General Maddox | Comments Off on In New York, defiant Ahmadinejad says Israel will be “eliminated” | Reuters… Or did he? 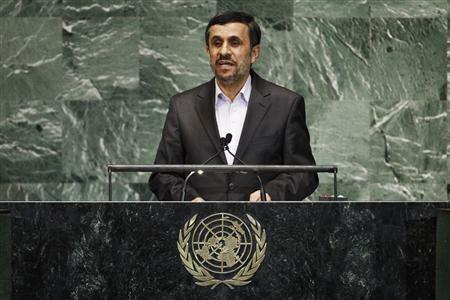 In New York, defiant Ahmadinejad says Israel will be “eliminated” | Reuters… Or did he? OK here we go again with more propaganda being forced on the public in order to manufacture consent for an attack on Iran. All this article tries to do is paint Ahmadinejad as a Crazy, War Hungry, Anti-Semite. The header alone is a blatant lie. No, he did not say that. What’s worse is that all through the comments you see nothing but support for the article and anti-Iran slander. Yesterday reuters told us that Iran was singled out by Ban Ki Moon – then you read the actual quote – they were NOT. And find out that he did NOT. What kind of sickening, war mongering progaganda outlet is this?? Well said PendingApproval. Whomever you are. Well said.